Butterfly Reflections, Ink. : Hope...this makes you smile! Hi everyone!! I'm so happy to be a guest on the BRI blog today!! I used a few different companies for my card today, so let's get started! I started by picking out quite a few Altenew Ink colours. I chose: Volcano Lake, Mountain Mist, Buttercream, Frayed Leaf, Soft Lilac, Rose Quartz, Puffy Heart and a little bit of Sea Glass. I use the mini ink cubes so this is an affordable way to have lots of colours!! 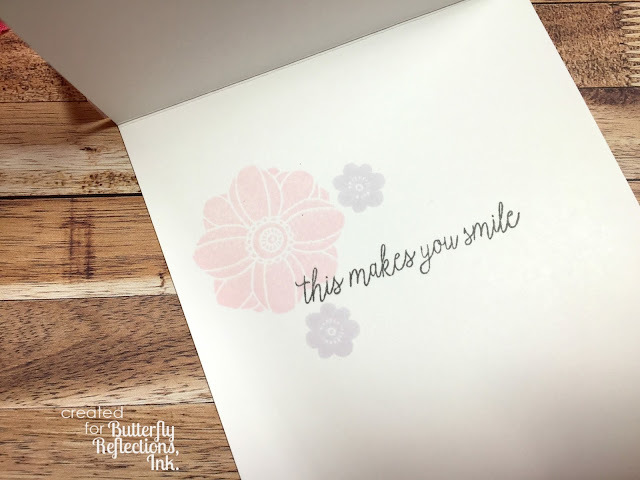 I stamped the solid image flowers from the Doodle Flowers 2 Stamp Set from Jane's Doodles onto a white card panel. (This stamp set is ON SALE AND IN STOCK while I'm typing this!!) This set is so pretty and whimsical. To add a bit of detail to the flowers, I used coloured pencils and basically flicked colour from the centre of the petals out. Super easy but makes a world of difference! I cut a bit off the bottom using one of the dies from the Scallop Border Dies from Pretty Pink Posh. This set is new to me and I love it! I foam mounted the stamped panel onto a top fold, A2 card base, also white. 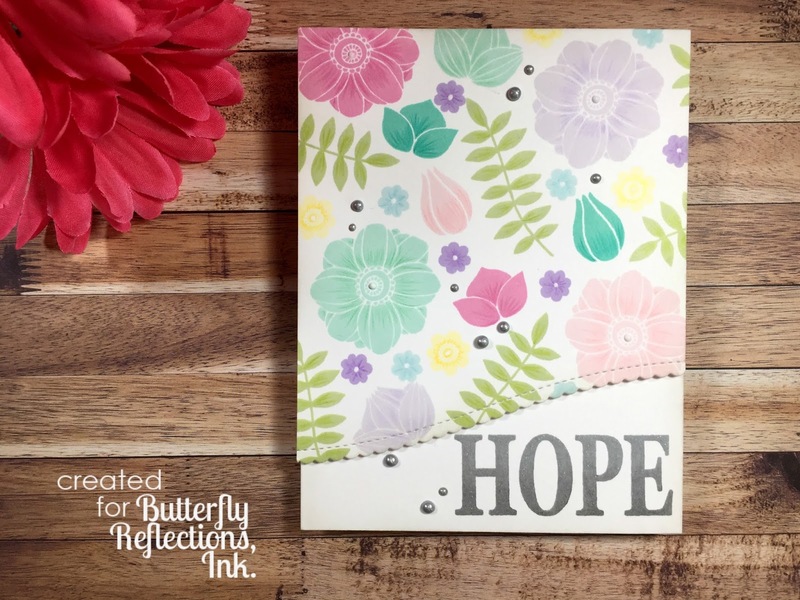 The sentiment I chose comes from the Hope Stamp Set from Concord and 9th. I inked it up using Soft Granite and Charcoal ink from Hero Arts. This created a very subtle gradient. Of course I had to load it up with Clear Sparkle! 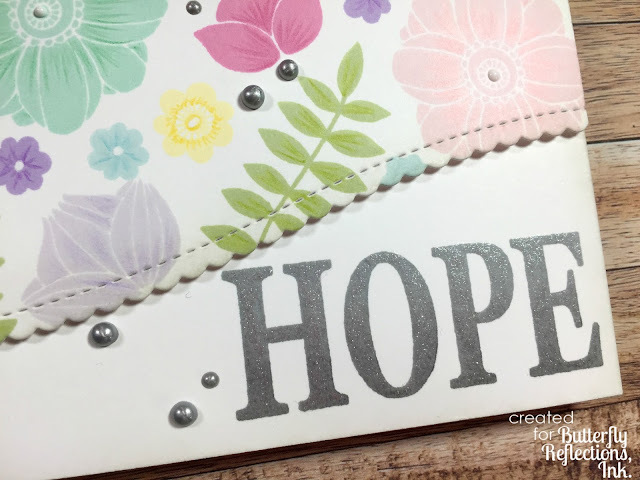 For embellishments, I decided to use a little Gloss White Crystal Drops in the centres of the flowers and quite a few drops of the Metallic Silver Lining Crystal Drops to fill in some blank spaces. 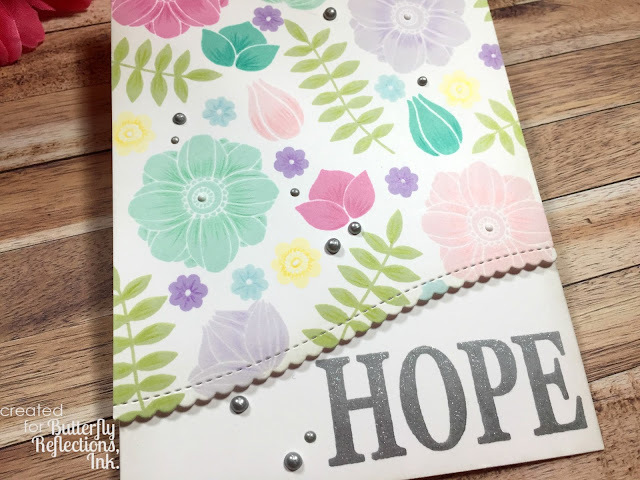 I stamped the remainder of the sentiment on the inside of the card along with a few of the flowers. I had so much fun stamping this card out! I hope it made YOU smile!! Thank you so much for stopping by today!! Have a great week!! Really pretty. I love the soft colors and that curved edge cut.